When trees are cut down to ground level or above, they leave a stump where nothing can grow except mushrooms and shoots from the still living root system. In some cases, you can transform it in a table or something useful for your summer garden, but in most cases its just defiling your beautiful garden. If that’s the case, don’t you think its time to call for a professional. Our modern stump removal equipment is light, maneuverable, quick, and non-intrusive. Even the most inaccessible places are no trouble at all for us. In fact our machines are able to go through areas as narrow as a doorway. All of our machinery is manufactered by known brands. We utilize high horsepower self propelled machines which can handle any size stumps, located anywhere in your property. Whether is a leftover from a century tree or just a tree planted a couple years ago, our equipment can handle it. So have you recently used a tree cutting service. And do you have annoying leftovers at your yard. If the answer is yes then why are you still postponing. When you are just one phone call from a soluion to all of yours stump related problems. 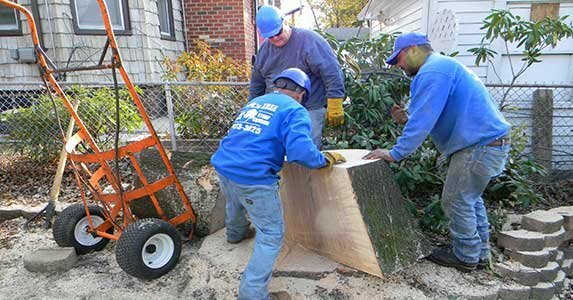 How are tree stumps removed? Stumps are also removed with tractors by digging large holes and pushing or pulling them out. However, in most cases, a root can break surrounding hardscapes or utilities while being lifted. Stumps can be dug out by hand with picks, axes and shovels. Sometimes this is the only way to remove a stump without causing damage to the surrounding area. Hunt’s Stump Removal, Inc., is prepared for all of these possibilities. There is no stump we cannot remove! How can I help in order to save time and money? Before constructing fences or installing landscapes, be sure to inspect for stumps. This may allow for larger equipment to be used. Clear away any rocks and large debris that are around the stumps. This saves time locating roots and helps the machines to stay sharp. If needed, watering the stump area the night before will be suggested to reduce the amount of dust created during removal. However, too much watering will make the stump removal more difficult and messy. Use stump-grinding mulch in your landscape to maintain moisture. This saves in hauling costs. 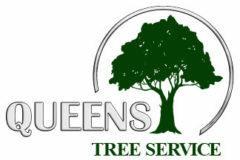 Queens Tree Service has an $185.00 minimum charge, which covers most stumps up to 12 inches in diameter. However, we do not charge on a per-stump basis. Therefore, you can have more than one stump removed for the same minimum charge or in smaller additional increments depending on the stump sizes, locations and grinding specifications.